Two subsequent development pathways took CM2.1 as their starting point producing climate models with enhanced representation of atmospheric chemistry, aerosols and clouds (CM3), and of biogeochemical processes (ESM2M and ESM2G). 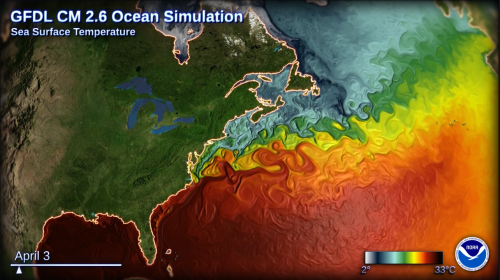 A third stream of development attempted to improve CM2.1’s simulation by increasing the resolution of the atmospheric and oceanic components. This effort produced CM2.5 and its variants FLOR, HiFLOR and CM2.6. CM2.5 has factor of four resolution increases in its atmospheric and oceanic components relative to CM2.1, along with a 33% increase in the number of vertical levels in the atmosphere. A further refinement of the ocean component to 1/10o produced CM2.6 which can claim to resolve ocean eddies based on agreement with an observational estimate of the eddy kinetic energy. Because seasonal predictions need large ensembles of model runs, the CM2.5 model is not practical for seasonal prediction at this time due to limits on computational resources. Therefore, a variant of CM2.5 was produced with a coarse (1o) ocean that both doubled the model speed and permitted the use of existing ocean assimilation systems. This version, called FLOR (for “Forecast version Low Ocean Resolution”) is now also used as part of the NMME, producing seasonal predictions on a real-time basis. HiFLOR is an experimental version of FLOR with twice the atmospheric resolution. HiFLOR’s higher resolution atmosphere allows simulation of tropical cyclone activity including category 4 and 5 storms. The model can skillfully predict year-to-year variations in Atlantic storm activity a few months in advance. It even has some skill forecasting landfall frequencies along the US coast. HiFLOR’s simulation of precipitation over the continental US is improved relative to the lower-resolution-atmosphere models. The model also shows a greater increase of extreme precipitation events over the eastern seaboard of the US with increasing atmospheric CO2 relative to lower resolution models due to its improved simulation of Atlantic hurricanes. Improved resolution of details of Atlantic Ocean circulation and bottom topography off of the U.S. east coast in CM2.6 led to the simulation of an intense warming feature in response to increasing CO2 not present in lower-resolution- ocean models. This warming is expected to influence fisheries in the region. CM2.6 has been used to assess the influence of future warming on several species inhabiting the U.S. northeast continental shelf. CM2.5 has been applied to the problem of the future of global snow cover in a warming climate where its resolution allows improved simulation of changes in mountainous regions. The sign of projected snowfall changes was reversed in some regions due to the better representation of orographic effects. Although it is essential for addressing certain climate problems, the increased realism of high resolution modeling comes at a cost. When resolution is increased, grid cell sizes are reduced and more of them are needed to cover the globe. The computational expense of a model increases with the number of such cells. Consequently, high resolution climate models are best used in conjunction with other tools that are more amenable to exploring long time scales or focus on incorporating comprehensive climate processes. Judicious use of a variety of models with differing resolutions allows robust results to be established. Kapnick, S., and T.L. Delworth, 2013: Controls of global snow under a changed climate. J. Climate, 26 (15), 5537-5562. Kleisner, K.M., M.J. Fogarty, S. McGee, S. Moret, C.T. Perretti, and V.S. Saba, 2017: Marine species distribution shifts on the U.S. Northeast Continental Shelf under continued ocean warming. Progress in Oceanography. DOI:10.1016/j.pocean.2017.04.001. Murakami, H., G. A. Vecchi, G. Villarini, T. L. Delworth, R. Gudgel, S. Underwood, X. Yang, W. Zhang, and S. Lin, 2016: Seasonal forecasts of major hurricanes and landfalling tropical cyclones using a high-resolution GFDL coupled climate model. J. Climate, 29, 7977-7989. Saba, V.S., S.M. Griffies, W.G. Anderson, M. Winton, M.A. Alexander, T.L. Delworth, J.A. Hare, M.J. Harrison, A. Rosati, G.A. Vecchi, and R. Zhang, 2016: Enhanced warming of the northwest Atlantic Ocean under climate change. Journal of Geophysical Research, 121(1), DOI:10.1002/2015JC011346.